It’s already begun. 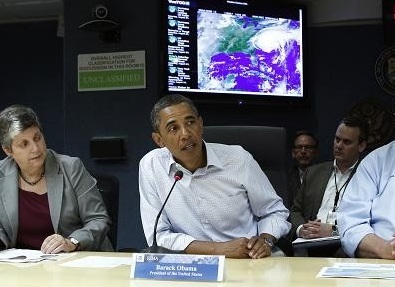 Barack Obama and his shills in the media, no longer credibly able to blame the Tea Party or Sarah Palin for the weak economy, have a new scapegoat for their poor performance: Hurricane Irene. In an article on Sunday in the Mail Online, we are told that the economic hit to New York could trigger a double-dip recession. This is the excuse, but before we accept this barrow-load of horseapples, we should instead refute them with their own previous, pathetic propositions. Aside from the plain fact that we’ve been sliding into a deeper recession for months, there is another reason to reject this latest narrative, and it comes not from some advocate of the Austrian school of economics, but instead from the pages of their very own apologists for failed Keynesian policies. I’ve covered this before, but ladies and gentlemen, it’s time to remember that champion of Obamanomics, that Nobel Laureate with tremendous imagination and no shortfall of excuses, that propaganda-spewing weasel of epic proportions: Paul Krugman of the New York Times. You may remember just a short few weeks ago, I took Krugman to task for his Keynesian proposition that if only aliens were to arrive, it would generate great economic growth and activity. What Krugman was really proposing is the notion that a war might do our economy some good. It was Krugman’s postulate that by gearing up for war, and spurring new production, the economy would be boosted. While the notion is really absurd in most respects, I now feel compelled by events to throw it right back in his face. After all, won’t the damage wrought by Hurricane Irene also spawn more production? Won’t this tend to reverse the results of any deleterious effects of the hurricane itself? According to that bastardized Keynesian logic Krugman so dearly loves, this should represent an economic growth opportunity rather than a calamity. I am certain that once Krugman and the Obama-drones get wind of this article, they will immediately retract, or somehow attempt to differentiate. They’ll tell us “but a War is man-made, and not an act of nature.” Fine, if you’re foolish enough to believe that, but then what of “aliens attacking?” Certainly that is not man-made, but simply an act of nature, right? As they will spin and flail to find some way to tie the economic tidings to anything and anyone other than Obama, they will concoct every manner of reason why this hurricane is somehow different from their previous statements on the opportunities presented by disasters. According to their broken logic, this event should be more stimulative than harmful, and it’s a wonder that despite the Lamestream media’s sycophantic, slavish regard for Mr. Obama, nobody even on the center-right side has caught onto this theme. It’s pathetic. Here we have the perfect demonstration of reality, and the negative economic effects of a natural disaster, and it is a perfect example of Frederic Bastiat’s famous economic thesis: That Which is Seen and That Which is Not Seen. While this fundamental concept of economics clearly applies to this or any other hurricane or “alien invasion,” still this is not what their economic apologists like Krugman predict. I think it’s high time that we insist that they either admit that Keynesian stimuli are part of a broken philosophy, or that they stand by that philosophy and proclaim the problems wrought by Hurrican Irene as an opportunity. Either way, their philosophical goose is cooked. Of course, unless we make it abundantly clear, they’ll succeed in blaming an economy well on its way over the precipice on the hurricane, but you and I both know this is a nonsensical claim. Our economy has handled hurricanes without falling into economic crisis before, and what they’ll offer is that this makes a bad situation worse. We must not permit them that argument without demanding they likewise discard the previous argument about the stimulative effects of government spending on war, natural disasters, and aliens attacking. It’s a fraud, and withe the Mail Online article pointing the direction to their next deceitful excuse, I think it’s time we made a preemptive strike of our own. They can’t have it both way, unless we permit it. Update by Doug: More on Obama’s inability–and Governor Palin’s ability–to comprehend Bastiat’s broken window fallacy here.